A month ago I noted that in spite of Labour's poll lead over the Tories, Ed Miliband's popularity among voters continues to trail that of his Conservative counterpart David Cameron. Not only do Brits believe Mr Cameron would make the better leader, but--at least according to one poll--actually see him as cooler than the guy who supports the Red Sox. Thankfully, the ever inquisitive people at YouGov have just completed a new poll that allows us to look at public perception of the two party leaders in even greater detail than before. This time YouGov asked respondents to identify which terms from a list of 14 they thought best applied to each of the two men; they were allowed to pick up to three for Mr Cameron, and up to three for Mr Miliband. Results are presented in the two charts below. In the spirit of beginning with the bad news, results for the 7 negative terms are presented first. Mr Cameron is viewed as substantially more privileged, somewhat less caring, and slightly more artificial and dishonest. Comparatively, Mr Miliband is regarded as considerably weirder and substantially more out-of-his-depth. Turning now to the good news, results for the 7 positive terms are presented in the second chart. Here the differences are generally smaller, yet the two men are still by no means identical. 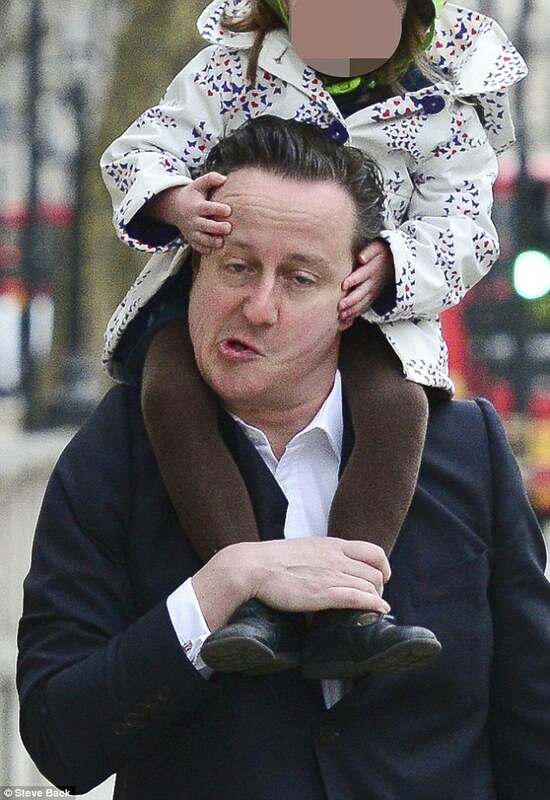 Mr Cameron is thought to be somewhat more statesmanlike, somewhat more competent, and somewhat more intelligent. 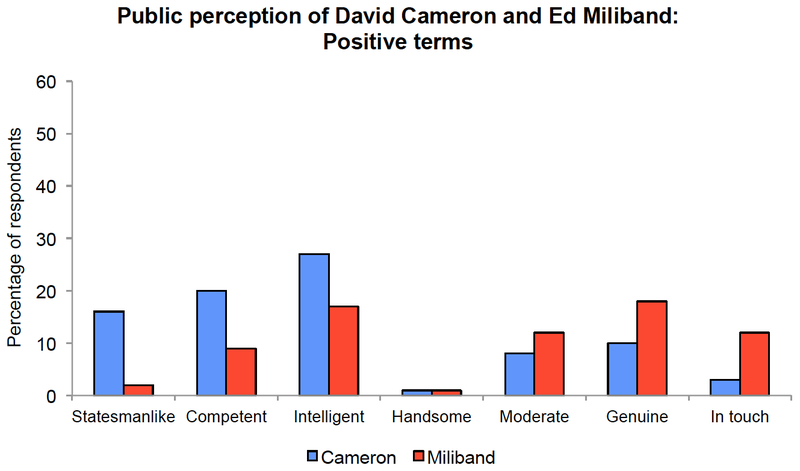 In comparison, Mr Miliband is considered slightly more moderate, somewhat more genuine, and somewhat more in-touch. Neither man would be wise to bank on his looks. Personally, I am not aware of any evidence that "most Britons" are "suspicious of an agenda that appears hostile to free enterprise". For example, YouGov polls indicate that a majority of British people favour: public ownership of the NHS, public ownership of energy companies, public ownership of Royal Mail, public ownership of the railways, price controls in the transportation sector, price controls in the energy sector, and raising the top rate of income tax to 50%. Though no doubt enthused by these figures, readers of a progressive disposition will be unhappy to learn that a majority of British people apparently also favour: cutting welfare benefits, reintroducing the death penalty for certain offences, trimming foreign aid, banning the burqa, and reducing net migration to zero. Overall, it would appear that the British public has a rather statist-authoritarian streak. There is little doubt in the scientific community that continually growing amounts of greenhouse gases in the atmosphere, due largely to carbon-dioxide emissions from the conventional use of fossil fuels, are influencing the climate. There is also little doubt that the carbon dioxide will persist in the atmosphere for several centuries. An international commitment to a sustained global climate observation system would generate an ever-lengthening record of more precise observations. And increasingly powerful computers can allow a better understanding of the uncertainties in our models, finer model grids and more sophisticated descriptions of the processes that occur within them. The science is urgent, since we could be caught flat-footed if our understanding does not improve more rapidly than the climate itself changes. I have no idea whether Koonin's scepticism about climate models is representative of current scientific thinking. However, his essay got me thinking about the oft-heard claim that the only reason why some scientists have raised the alarm over climate change is to make safe their own funding. In particular, it made me realise how difficult it is to square this claim with the facts. If climate scientists were simply trying to secure more money for themselves, the rational thing for them to do would be to promote the idea that there was little scientific consensus over climate change. After all, the case for shuttling additional research dollars into climate science would be much weaker if there wasn't any argument left to settle. What are the political views of influential U.S. billionaires? Darrel West, a scholar at the respected Democrat-leaning think-tank The Brookings Institution, has recently compiled a ranking of the 19 most politically influential billionaires in the United States. (I'm not quite sure why he chose the top 19, rather than say the top 20.) 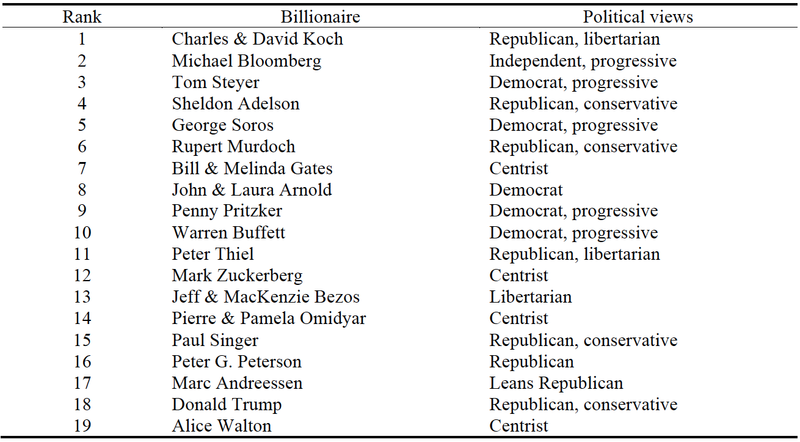 Using a combination of the information given in West's original article, the pertinent individuals' Wikipedia and Forbes pages, as well as Google searches, I have identified the political views of each individual on the list. Interestingly, nearly as many lean left as lean right. Now of course, it seems rather unlikely that any of the left-leaning billionaires are dyed-in-the-wool, sickle wielding, raise-the-red-flag communists; here we are presumably talking about the centre-left. Nevertheless, it is noteworthy that well-to-do activists with a left-of-centre disposition are over-represented at the top of West's ranking. In terms of absolute fractions, 47% lean right and 32% lean left. But if each person is weighted by the inverse of his rank (i.e., the Koch brothers get '19'), then 42% lean right, while 44% lean left. It being late 2014, time to start thinking about the next U.S. presidential election is of course rapidly approaching. With only a year-and-a-half to go, all the bells, whistles and melodrama of that event are now practically imminent. And while it is not yet clear which Democrat and which Republican will battle it out on the final furlong for presidency, a number of individuals have been put forward as potential competitors. Helpfully, several of these individuals featured in a recent poll where YouGov asked Americans to voice their opinion on a selection of prominent U.S. politicians. The list of politicians was twelvefold, comprising nine Republicans and three Democrats. The nine Republicans were: Rand Paul, Chris Christie, Jeb Bush, Mike Huckabee, Marco Rubio, Ted Cruz, Scott Walker, and Rick Perry. The three Democrats were: Hilary Clinton, Elizabeth Warren, and Brian Schweitzer. In each case, respondents were required to state whether they had a "very favourable", "somewhat favourable", "somewhat unfavourable", or "very unfavourable" opinion of the politician under scrutiny; they were also given the option of replying "don't know". The results are broken down along a number of dimensions, one of which happens to be party identification (Republican, Democrat, or Independent). We can therefore get some insight into the following questions. 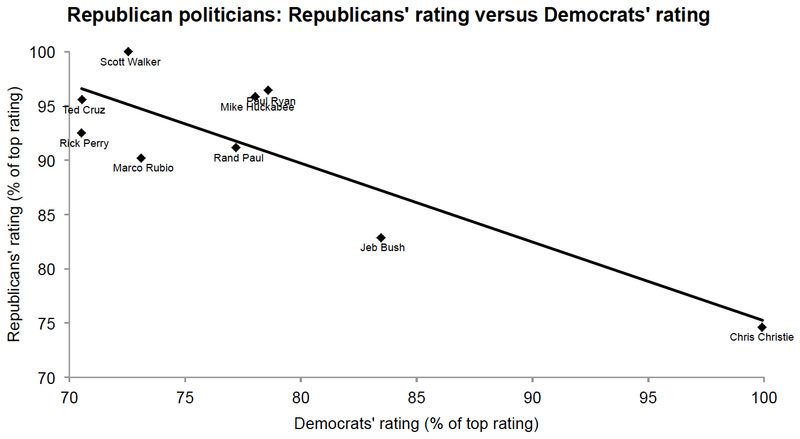 Do politicians who are loved by members of one party tend to be hated less or hated more by members of the other? And conversely, do politicians who are reviled by members of one party tend to be adored more or adored less by members of the other? The most obvious answer is that if an aspiring candidate is loved by members of one party, she will surely be hated more by members of the other, while if she is reviled by members of one party, she will surely be adored more by members of the other. However, a not-implausible alternative is that objectively better candidates are liked more by members of both parties, meaning that the candidate who is seen as ideal by members of one party will be the one who is seen as least-bad by members of the other. But according to YouGov's numbers, it is the obvious answer that is correct. 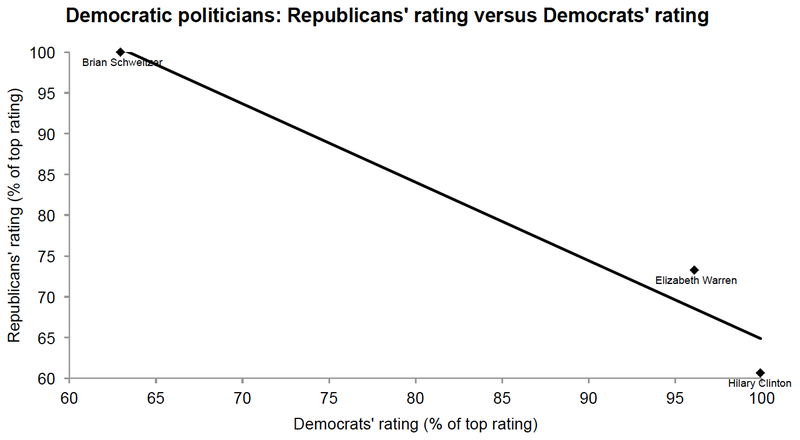 The two charts below display, respectively for Republican politicians and Democratic politicians, the relationship between politicians' average rating from Republican respondents and their average rating from Democratic respondents. Average rating was computed by: first assigning '5' to "very favourable", '4' to "somewhat favourable", '2' to "somewhat unfavourable", and '1' to "very unfavourable"; then calculating a weighted average; next dividing by the percentage of respondents who gave a response (as opposed to saying "don't know"); and finally re-scaling as a percentage of the rating of top-rated politician among the particular party's respondents. The correlation for the first graph is –.85 (p < 0.01); the correlation for the second graph is –.97 (p > 0.1). A rather important caveat is that an inference from n = 9 is at best questionable, while an inference from n = 3 is bordering on criminal! Incidentally, the reason for dividing by the percentage of respondents who gave a response is to make the figure conditional on having heard of the individual. While some respondents may respond "don't know" because they genuinely hold a neutral opinion, it seems likely that most do so because they have not actually heard of the person in question. For example, in the case of Brian Schweitzer, nearly 70% of both parties' members replied "don't know", presumably because (like me), they didn't know who he was. In terms of the unconditional ratings, Mr Huckabee is the top-rated among Republicans, and Mrs Clinton is still the top-rated among Democrats. There can be little doubt that James Bond, perhaps the most successful long-running film series of all time, is a shimmering emblem of contemporary British culture. The illustrious character's cinematic career began all the way back in 1962 with the path-breaking thriller Dr. No, and since then it has gone from unflagging strength to unflagging strength. Bond movies consistently rake in substantially more at the box office than is forked out on their productions. Our gallant protagonist is watched, admired and celebrated not just in the British Isles but in countless other countries around the world. Indeed, two years ago in 2012, his presence embellished an occasion of no less global significance than the London Olympics' opening ceremony. And yet there is a frighteningly real possibility that, with Scottish independence and the dissolution of the British Union, James Bond could be brought to a rather abrupt end. Readers sensible enough not to have missed the tireless series' latest instalment, Skyfall, will be aware that Bond is the son of a Scotsman, Andrew Bond, and that he grew up in the stunningly beautiful yet ruggedly mysterious landscape of Glencoe, Scotland. Although to my knowledge we are never actually informed of Bond's birthplace, it seems highly likely that he was therefore also born in the land of your wee bit hill and glen. Bond, are you listening? I've got some thoroughly rotten news. Those chaps over at the foreign office aren't playing cricket, so I'm afraid the service is letting you go. Of course an alternative possibility is that Bond, along with all the other Scots-born Brits currently residing in some other part of the U.K., would be granted dual citizenship in the event of Scottish independence. MI6 reports that appointees with dual nationality are required to foreswear their non-British citizenship as a condition of appointment to the service. In this case then, Bond would be able to continue working for MI6, but only if he agreed to renounce his Scottish citizenship. I suppose there is at least one major reason to think he would choose to do so (spoiler alert), namely the sombre memories he has of the country where his late parents are buried. Indeed, when prompted with "country" in a simple word-association task, he responds emphatically with "England". However, this would be a hollow victory. After all, Bond is not an English icon; nor is he a Scottish one. He is British right to the core. In the early chapters of his book, Harford deals with the topic of recessions, and in particular the phenomenon of downward nominal wage rigidity. This is where, during a recession, wages fail to go down when the demand for labour falls. One of the chief consequences is involuntary unemployment; because the price of labour remains constant, quantity drops further than it otherwise would. Nominal wage rigidity occurs for a variety of reasons, including menu costs, and the tendency for people to think in nominal terms combined with a belief in fair wages. My question, which essentially just restates what Bryan Caplan has asserted several times, is as follows. Doesn't the existence of involuntary unemployment due to nominal wage rigidity constitute a fairly strong argument against the minimum wage? Indeed, as Caplan notes, it seems to constitute an argument for government interventions designed to actively push down wages during recessions. I'm genuinely interested to know the answer to this question; there seem to be many respectable Keynesian economists who are in favour of the minimum wage, which leads to the possibility that there is something that Caplan and I have missed.